Lisa Levart, an award-winning artist and photographer based in Rockland County, has been creating alternative photographic portraits of women embodying poetic myths for well over a decade. In this special presentation, Lisa will talk about her current project, "Women of the Ramapo Lenape Nation," a creative collaboration that aims to uncover long-forgotten Lenape myths. Taking re-remembered sacred stories as a foundation, she uses a technique of collaging metal, wood, water and concrete into portraits of Ramapough Lenape women of today, hand-painting the images with encaustic wax resin. The applied wax alters the final images, blending contemporary and ancient portraiture across the expanse of time. The presentation includes a description of the work and the stories on which it is based, along with the screening of a documentary-film-in-progress about the project by Myles Aronowitz. 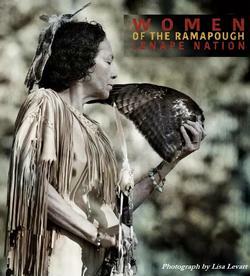 "Women of the Ramapough Lenape Nation" is made possible with funds from the DeCentralization Program, a re-grant program of the New York State Council on the Arts with the support of Andrew Cuomo and the New York State Legislature, and administered by the Arts Council of Rockland. The May 24 presentation will provide a preview of the special exhibition, "The Women of the Ramapo Lenape Nation," coming to the HSRC in the fall. About the speaker: Since 2001, Lisa Levart has traveled across America creating portraits of women who are part of the rapidly growing Earth-centered spirituality movement. Using photographic imagery and immersive multimedia installations, she explores the interconnectivity between humans and nature; modern womanhood and ancient mythology; and the sanctity of the Mother Earth. She holds a bachelor in fine arts from SUNY-College at Purchase, where she studied the Martha Graham dance technique, a thematic focus that continues to influence her work.